27 years ago, Community Coffee started the Cash for Schools program to enable loyal customers to give back to their local schools. Over those 27 years, schools have earned new textbooks, computers, whiteboards, campus gardens, playground equipment, and even a natural bird sanctuary for a science class. Each year schools earn thousands of dollars to support the education of our youth – – just think what that amount of money could mean for your school! This year, 826 schools (Pre-K through 12th grade) participated and earned over $368,000. Public and private schools across the area have earned millions of dollars for their local programs through the Community Cash for Schools program, which has seen continued success over the last 27 years. 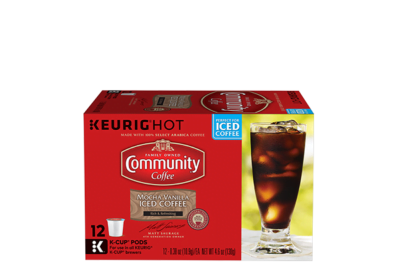 Schools earn money by collecting UPC labels from Community® brand products, including coffee and tea products. Schools allocate the money earned toward initiatives and projects such as new computers, textbooks, equipment, whiteboards, and other educational necessities. The program is open to local public and private schools from Pre-K through 12th grade. For more information on the Community Cash for Schools® program, go to CommunityCoffee.com/CashforSchools and enroll online or call 800-25- 5583. 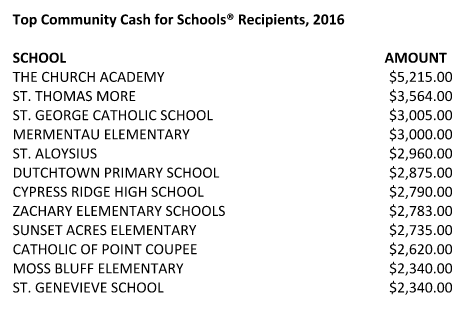 Following is a list of the 2015-2016 top Community Cash for Schools® recipients. The Community Cash For Schools® program supports participating schools that collect Proofs of Purchase from Community® products. These product Proofs of Purchase can be redeemed for cash that each school can spend at its discretion. There are no stipulations on how the money is spent. Schools can choose to allocate the money toward new textbooks, computers or even events. This program is entering its 28th year and to date it has helped participating schools generate over $6.5 million!